Thank You for registering for the 7th MAXXIS ESC Enduro of 2018. We are excited to heading to a popular enduro only race venue. This round will feature 6 race stages and the FOX Transfer Seatpost Challenge. We have plenty of spots available at onsite registration, so invite your friends ! If you have not paid for your plate or registration, please note it is CASH only and no ATM machines are on site. Attached are a couple documents for you to review, one is the map. We will NOT have printed maps for this event as the course is easy to follow, so if you want one please print it. Please fill out the Registration Form and Waivers, it’ll save you some time. Yes even if you pre reg’d you still need to fill out the forms. The 2018 MAXXIS ESC Enduro rules are also attached, there have been some changes, so it would be best to read everything. We will be onsite Friday afternoon but please understand we cannot do any registration on Friday. We have to set up the starts and finishes and we really want to ride our bike too ! Camping is a very reasonable $10 per vehicle for Saturday Night, payable at the Maxxis ESC tents. Camping Tags will be issued. Vehicles without a camping tag onsite Saturday 8pm will be charged the camping fee plus a $10 late charge or asked to leave the property. Of course, we don’t want to deal with that so please pay at registration. Camping tags are available on the pre-registration page or onsite. Please make sure to pick up your Saturday camping pass at Registration. Back is the FOX Seatpost Climbers Challenge. We’ll award the fastest amateur a FOX Transfer Seatpost and the fastest in every class some cool FOX Socks. Remember you must chip in and out on the climb. The contest will be held at the first transfer of the day. Please do not chip in and out except on your first pass. The ALEX RIMS Super Stage is back too!. This competition awards the fastest amateur male and amateur female a pair of Alex Rims Volar rims, it will be contested on STAGE 5. We will be selling 2018 Maxxis ESC socks, hats, and fenders at the registration area all weekend. FRIDAY – Courses are marked. From Victory Hill Sector: Racers riding passes for Friday are included with race registratiom. Racers need to bring their Maxxis ESC Number Plate to Carol’s house at 2428 Victory Hill Rd, fill out waivers, and get wristband day passes. Otherwise they’ll get busted. • PARKING – If the lots are full please park legally on the street, do not block driveways, hydrants and lock your car. No EZ Ups allowed on the streets. • CAMPING –Primitive Camping is in the field is a very reasonable $10 per vehicle for Saturday Night, payable at the Maxxis ESC tents. Camping Tags will be issued. Vehicles without a camping tag onsite Saturday 8pm will be charged the camping fee plus a $10 late charge or asked to leave the property. Of course, we don’t want to deal with that so please pay at registration. Camping tags are available on the pre-registration page or onsite. Please make sure to pick up your Saturday camping pass at Registration. There are no services or potable water available onsite but 4 Porta-Pottys will be on site. • NO SHUTTLING – That goes for all weekend for everyone. If you are seen/reported/caught/whatever shuttling you will be assessed a time penalty. Trust us you will not be on the podium if you try, so don’t. • NUMBER PLATES – Will be sold at registration for $10 each. A 2018 MAXXIS ESC Number Plate must be affixed correctly to your bike always while on the tracks this weekend at Victory Hill. You will not be allowed to ride without one. No cuts or trimming allowed on the plate please. • RAIN – Don’t even go there !! • SAFETY – Calex Search and Rescue will be on site for practice and racing. 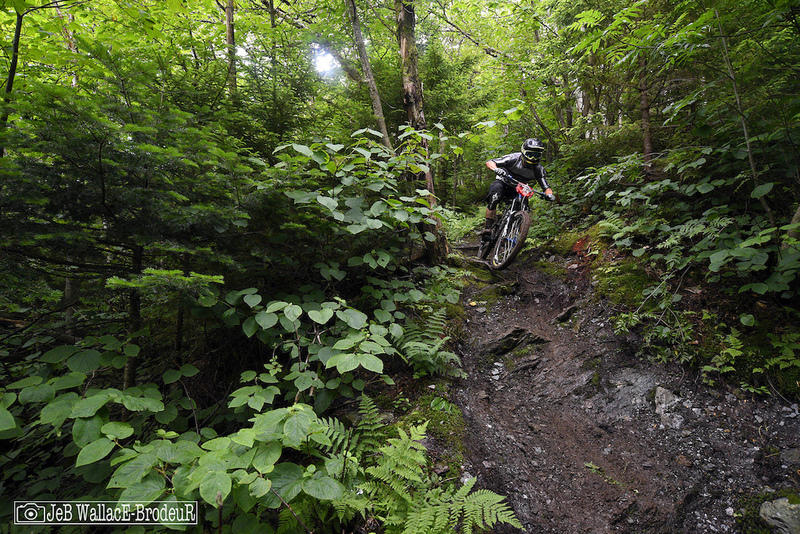 • BURKE MOUNTAIN BIKE ’N BREW – Join us Saturday for the 4pm to 7pm sampling at the 10th Annual Burke Bike n’ Brew at Burke Mountain featuring live music, riding, bike games and sampling some of the best beers Vermont has to offer! They’ll also be pouring Rookies Root beer for designated drivers and kids of all ages. Maxxis ESC Racers get in for the discounted rate of $20!! • AWARDS – as always Racers MUST be present at the Series Final Award Ceremonies or at the Race Award Ceremony to Receive Awards and/or Cash Payouts!